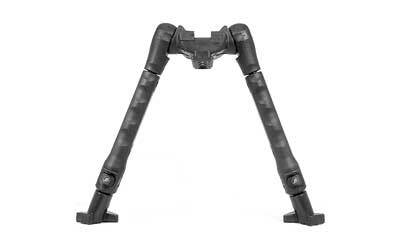 This versatile bipod mounts onto the bottom Picatinny rail and is ideal for snipers sharpshooters and other missions. The strong lightweight design manufactured from stainless steel and polymer is super rugged. There are no external springs the whole mechanism is encased to prevent dirt or sand infiltration and rubber covers provide a nonslip grip. The legs lock in five different positions and have a quick release push button leg extension with push button guard. They operate separately and can be set at different heights for use on uneven terrain. Legs can be attacheddetached with two swift movements and can be folded to the front or back. The concave base mount provides a more stable center of gravity and includes a 3 Picatinny rail for the addition of forward grip or other accessories."